ALIEN age 11 - Comic/Graphic Novel and Blog: "A stinkin' robot!" c.198x? Christ - it's bloody Monday again. UPDATE: It's now Monday evening. Yaay! Humans that turned out to be robots were such a popular feature of '70s sci-fi. 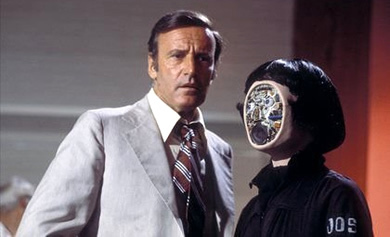 There was a phase of people who's faces came off to reveal circuitry - did it start with Stepford Wives? I'll pass it over to the readers to inform me on that one. 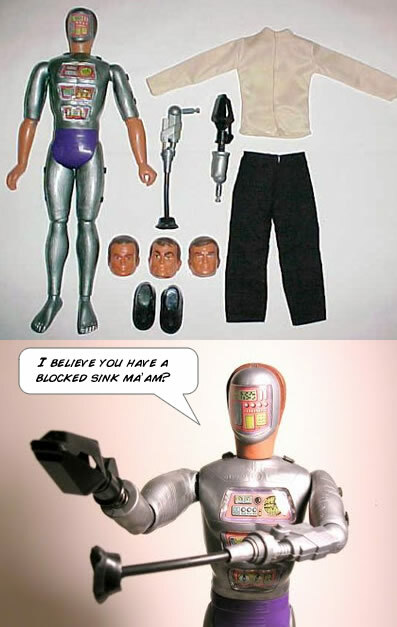 They appeared in Six Million Dollar Man, and Bionic Woman (as 'Fembots'). Even Oscar Goldman in $6M man was doppelgangered by one. A suspicious Steve Austin dropped a pen on to the carpet as Oscar paced back and forth - to see if his weight would crush it. Blow-dried TV's The Hardy Boys and Nancy Drew raided the same props closet and had a go too. And let's not forget 'Westworld' with Yul Bryner as a gunslinging android. Hey! - even Britain's Doctor Who did it. Eventually, $6M Man's arch Nemesis 'Maskatron' was created and sold as a toy in the 1977 thereabouts. He had the same sort of mask. Johnny has it now but doesn't play with it. Don't blame him - he's missing one of his spring-loaded legs. Boinnnnng! Milky, milky... 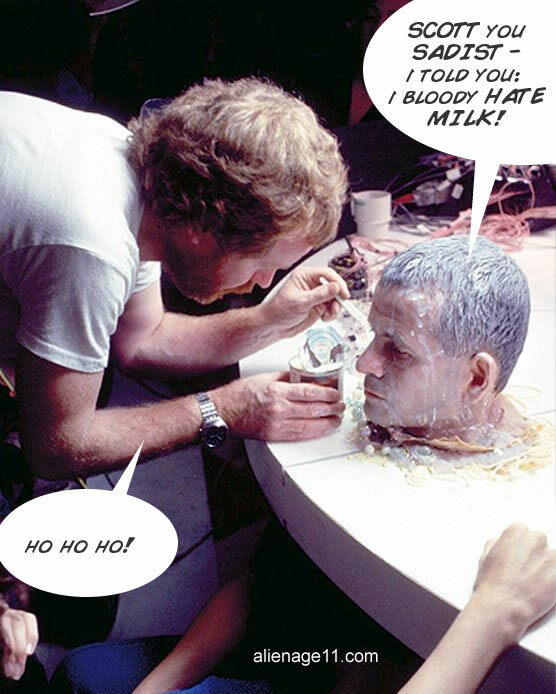 According to ALIEN Vault: Holm reputedly loathed the taste of milk. Here, Scott is putting on yet more condensed milk. (Now the reason for that nerdy trip down memory lane) Maybe this is why Dan O'Bannon and Ronald Shusett were so underwhelmed when the surprise reveal of Robot Ash was written into their already obliterated script? O'Bannon thought it was a really weak idea. There seems to have been a fascination - or perhaps a neurosis in the '70s about human looking robots. No doubt the sci-fi buff will be able to read a Red Menace mass hysteria into this - just as they do when discussing 1950's sci-fi. but maybe it was also about an internal crisis - of identity and what it means to be human. In the '70s, being a human was probably pretty dull if you were an adult. Even duller than now. Perhaps back then they also felt like robots, going through the soul-destroying 5 day weekly routine of getting up and going to work. Plus, there was no end of stories - in comics too - about the helpful domestic robot going crackers and trying to either imprison or kill its masters! More on Wednesday - as usual.